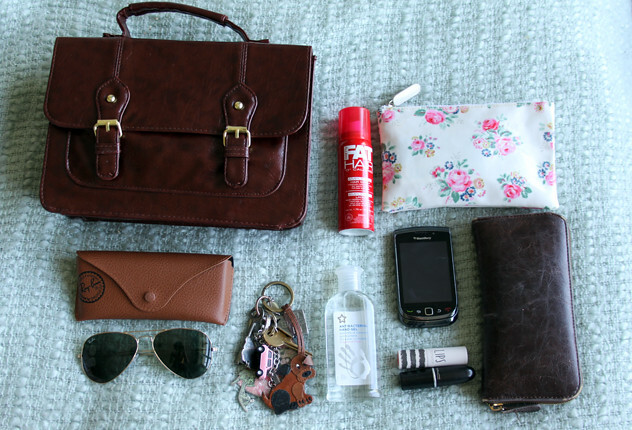 Thought it was about time I did an updated ‘What’s In My Bag?’ post to show off my new little satchel! Sorry about the lack of posts this week. I’ve been busy trying to get uni work out of the way. I can’t wait until everything is handed in and my exhibition is ready. It will be such a weight off my shoulders! Satchel – Bought this from Primark. It’s the perfect size for a day to day bag, and was a bargain at just £7.00! Fat Hair – I swear by this hairspray. It’s so good at creating volume in your hair without having to back comb. I have a large can on my dressing table but carry these miniatures round in my bag. Cath Kidston purse – This was a gift from some friends at uni when it was my birthday. I use it to carry round things like headache tablets and plasters for emergencies. Lipsticks – I always carry around a couple of lipsticks to touch up during the day. These two are Topshop – Ohh La La and MAC – Creme Cup. Hand Sanitizer – Just because! Keys – A collection of keys for the house and other things, and way too many key rings! Ray Ban Aviators – I’ve only just got these. I decided to treat myself to them for the Summer when they were in a 20% off mega day at John Lewis. Also, I have just put a HUGE Blog Sale up HERE with loads of things in sizes 8 to 14, including Vintage, Topshop, Miso, Miss Selfridge, Primark and Next! Please have a look and spread the word if you could! GORGEOUS GIFTS FROM FLAMINGO GIFTS! Almost all of the above! Minus the hairspray and change the blackberry for an Iphone. I try not to fill my bag with too much stuff, however my work bags are always full to bursting. It looks like I'm moving home! What with laptop, projectors, folders, posters, handouts…. I could go on forever! Love the bag by the way. ah i've been looking for thi satchel in primark for ages now, just can't seem to find it :(lovelvoeloveit!